Flavor 360 provides boutique catering for a full array of events ranging from intimate dinner parties and baby or bridal showers to cocktail parties and corporate gatherings. Each menu is designed with unique flavor combinations and every dish is hand-crafted with superior-quality whole foods. We provide exceptional, personalized service to customers while promoting small-batch cooking and farm fresh ingredients. Contact us today and let Flavor 360 make your event memorable! Call 314-706-0687 or send an email to Kara@Flavor360.org to book an event. Flavor 360 has your bar and beverage needs covered, whether you want to serve an array of cocktails or only need coffee service for a meeting. We are fully insured with a full liquor license. We proudly serve beer and soda from local vendors. All bar packages include ice, garnish, set up and break down. 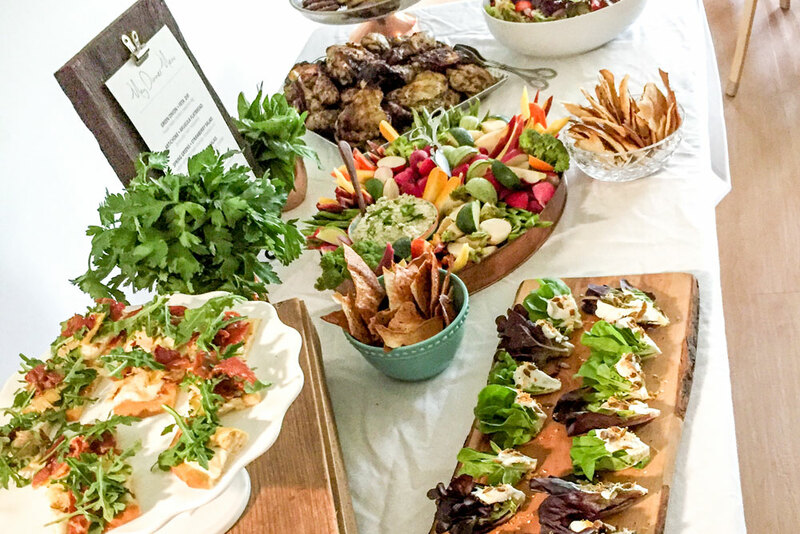 Flavor 360 will create a custom catering plan based on your event. From passing appetizers to serving meals to the table, we’re focused on making your experience just the way you need it. With our drop-off catering, we’ll provide personalized service taking care of the setup while displaying your meal on reusable trays. We’re here to make your event perfect, all the way down to the tables, table settings and decor. We will gladly assist you in renting equipment from one of our partners or can offer ideas to make your event extra-special from the moment your guests arrive. The food you share at your event will create a memorable experience for your guests and a relaxing one for you. Along with excellent food, dining with Flavor 360 means our set up at your event will be uniquely designed with your space in mind. Even if we are just dropping off your catered meal, you won’t get your delicious food in plastic containers. We serve our drop off catering in galvanized tin with customized labeling you can simply unwrap and present to your guests without sacrificing any of Flavor 360’s unique style. Either way, when Flavor 360 caters your event, we’ll create an unforgettable flavor experience for you and your guests. Our kitchen will take care of the details so you can enjoy conversation with your guests and focus on the most important part - them. Flavor 360 is committed to protecting the environment. Our packaging and utensils are created from materials you can recycle or compost after enjoying your meal. Learn more about our commitment to a better environment here. Once again you provided such high quality, delicious food for my party! Your menu suggestions were perfect and the food was incredible. The guests raved about the appetizers and I was so pleased with the presentation. I was again a big hit for serving your wonderful, tasty and beautifully-presented food. People at my event raved about it and looked about for how to contact you. Amazing quality and presentation, exceptional flavors and creativity and so easy to communicate and work with! Highly recommend! Thank you, thank you for everything last night! What a special night-everyone raved about the food! Also I was able to enjoy the party because of all of your help. Let Flavor 360 make your event memorable!